Introduction to GS1-128 Barcodes | Warehouse Management | Deacom, Inc.
What is a GS1-128 barcode? The GS1-128 barcode is a universal barcode application standard of the Code 128 barcode format. Formerly known as the UCC/EAN-128 barcode, it was developed by the GS1 US standards organization to provide a global standard for exchanging common data between companies. A GS1-128 barcode can contain a Serial Shipment Container Code (SSCC) used to identify a logistic unit, or item information including company code, item number, lot number, serial number, quantity, weight, and more. Any combination of these data points may be used by a company in a single barcode. 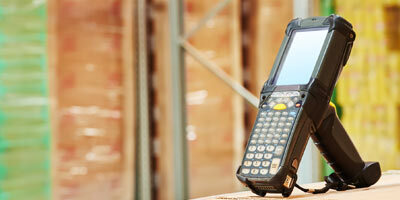 Why use GS1-128 barcodes to manage your inventory? GS1-128 barcodes always start with a single character control code called the Function Code 1 FNC1. An application identifier (AI), a smaller embedded numerical code representing a data element, and data follows the opening FNC1. Some application identifiers have a fixed character length. Those that have a variable number of characters require an additional FNC1 to identify the end of the data, unless it is at the end of the barcode. Depending on the application identifier, the overall length of the barcode can be 48 characters in length. The entire barcode requires white space before and after the printed barcode. The DEACOM Warehouse Management System is required to read GS1-128 barcodes and process the data they contain. These particular codes are used in receiving, job issuing, job finishing, and sales reserving so all the information DEACOM collects in a scan is automatically placed into the appropriate fields within the software. Both the enterprise resource planning and warehouse management systems rely on this information to identify and process items throughout the warehouse. Printable documents within the ERP software use a specific function to print all barcodes, including GS1-128 barcodes. Thee barcodes can be embedded on various forms and reports to expedite WMS scanner user access in specific transactions. 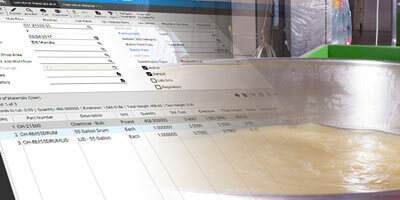 The ability for GS1-128 barcodes to contain and populate multiple data element fields helps to ensure correct data entry and save operators' time in filling out all applicable fields simultaneously. Utilizing GS1-128 barcodes, the WMS system has the capability to record a job finish transaction through the input production form with a single scan of a barcode. This can be used in cases where the user lot for a job finish is calculated automatically through the system. The barcode scanned needs to have the GTIN/Part Number, the Job Number, and an optional Serial Number for those manufacturers utilizing serialized parts. As these labels are coming off the production line they can be scanned by an end user. Typically, this process is used when palletizing because multiple items are coming off the line and are directed to the appropriate pallet. In this case the system can be used to assign all un-palletized user lots to the master lot being built. 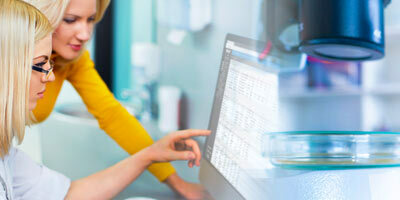 Want more information about Deacom's support for GS1-128 barcodes? Simply provide us with your email address and we'll get the conversation going. Automatically generate a CoA document with customer specific QC specifications at the time of shipment. Adjust and scale formulas as needed knowing that all changes will automatically be reflected in inventory, production, and planning tools. 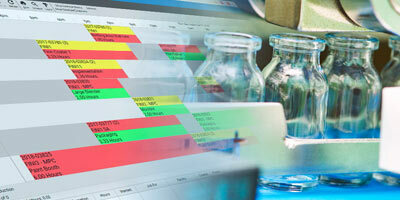 Simplify the process of creating, scheduling, staging, and analyzing production jobs within the single ERP system. The WMS system provides your manufacturing and distribution operations the ability to reach new levels of functional accuracy.